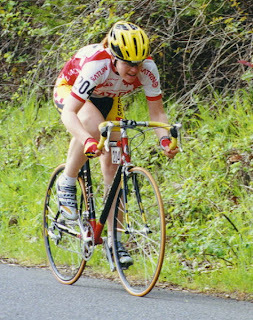 Clara Hughes, 18-time (!) Canadian national cycling champion, and winner of bronze medals in the time trial and road race in the 1996 Atlanta games, is going to be carrying the Canadian flag when the Olympics open in Vancouver on February 12. She also has won eight medals at the Pan American Games and the 1997 Liberty Classic in Philadelphia. And won the silver medal for road time trialling at the World Championships in 1995. Oh, and she is pretty good without a bicycle as well, having won a gold, silver and bronze medal in speed skating, making her the only athlete to win multiple medals at the Winter and Summer Olympic Games. She was also World Champion in the 5000 m event in 2004, and a World Record Holder in the 10,000 m.
But, honestly, how can somebody be National Champion 18 times? I don't think I will manage this, and as for speed skating I believe I am the only Canadian who cannot actually skate at all. Berlin Six Day Race Begins Today!